The motto Cardinal Newman chose for his coat of arms was "Heart speaks to heart". For a figure whose intellectual grounding grew out of the rarified scholasticism of Oxford, whose high minded ideals of what a University is have provided sound-bites for every Vice Chancellor who wants to add gravitas to their latest managerial wheeze, heart (as opposed to brain) is perhaps surprising. But Newman's intellectual journey is about discovering the heart. It is a different kind of 'speaking' that he articulates: not the speaking of the BBC's 'nation shall speak unto nation', whose latent message is "we're going to teach you all to be British!" Hearts do not speak like that. It is a tragedy that our Universities behave as if they acknowledge the BBC's interpretation of 'speaking' and not Newman's - they've even found clever ways of measuring the effectiveness of their 'speaking', and rewarding individuals who speak the loudest! When a person has been bereaved, we look them in the eye and feel something of the pain they feel - because deep within our own psyche, we know this sorrow is universal. And when we say "I'm sorry for your loss", we may also know (particularly if we have experienced grief ourselves) that this simple utterance in this particular moment really means something. Hearts speak when we know we are not alone. The problem for our Universities currently is that they have been increasingly indulging in a process of social atomisation. Rather than seeing themselves as communities of people (teachers, learners, administrators) who collectively are not alone, they increasingly see individual members of the community as replaceable functionaries whose purpose is to deliver to a "customer base" of students whose fees bolster the universities coffers. We might not unreasonably ask Does "belonging to the university" increasingly now mean little more than "being paid by it" or "getting a degree from it"? Social atomisation is a process which has become endemic in our society. We might date its current manifestation to Thatcher, although it has always existed to some extent. It is the product of a kind of individualism which affirms the rights of individuals to "choose" who they work for, or with, and where people are encouraged to be ever-mobile and dynamic in their careers. It is a kind of individualistically-driven egomania where nobody abides anywhere, nobody's commitment extends beyond that which suits them, and 'social responsibility' becomes redefined as compliance to legal and professional frameworks rather than vocation. The real question here is "whose will?" Social atomisation is an erosion of a universal, all-embracing will. Christians would call this the "will of God". The fact that the will of the individual is not the universal will underlies the struggle of all democratic societies since ancient times. Powerful individuals will want to present their will as the will of the people, but individual ego misleads the powerful into a delusion which ultimately catches up with them. The universal will eventually expresses itself (if perhaps only briefly before it is distorted again): we see it in the Ukraine now. But we are frequently reminded that the will of the individual is not universal or true. I attended the funeral recently of a one of the catering staff in my university and there was standing room only in the church. She was much loved, and the need for people to be together was profound despite the apparently modesty of her position in the institution. That is an expression of the universal will. The problem with social atomisation is that it ignores this. It is inherently paradoxical in presenting the collective will (an aggregation of individual wills) as in some way universal. But whilst the abstract idea of the collective as universal is untrue, legal frameworks established around abstract ideas gradually replace deeper ontologically grounded experience. A good example of this is the evolution of corporate governance codes: the Hampell report of 1998 states unequivocally that "The single overriding objective shared by all listed companies, whatever their size or type of business is the preservation and the greatest practical enhancement over time of their shareholders' investment" (I'm grateful to Hugh Willmott for highlighting the importance of corporate governance codes). This is a marked evolution of earlier codes of corporate governance which considered shareholder influence to be far less important (even destabilising) on effective corporate governance. The 1975 Corporate Report from the Accounting Standards Steering Committee (see http://www.ion.icaew.com/Talkaccountancyblog/18825) argued that privileging shareholders in governance was considered extreme by the majority of companies. Since then an individualistic shareholder-oriented abstracted model of effective accountability has become dominant. This overrides the real domain of corporation politics. Because it is abstract, it is easily subverted by powerful influences within the corporation which can eventually defend reneging on the advice of earlier corporate codes such as those contained in the Cadbury report (to which the Hampell report is a response) which warn against any single individual having powers of decision. The social atomisation to shareholder return in turn makes workers functionaries to produce this aim, each one rewarded according to the extent to which they serve the goal, and being replaceable by any other individual similarly motivated by self-interest. Cohesion and corporate identity are swallowed up by the will of the director who pretends to be fulfilling the corporate mission by meeting shareholder wishes. The heart goes out of the thing and we end up with HBOS, Enron, RBS, etc. Indeed, such failures bear similarity with Robert Maxwell's business empire, which was the prompt for the Cadbury report in the first place. Universities don't have shareholders. They do have boards of governors, whose contentment is most easily satisfied by the financial reports from the institution. In uncertain times, the greatest succour to governors will be the establishment of healthy financial surpluses which, it will be deemed, will off-set any irregularities in the student recruitment to institutions. The governors become a kind of shareholder, with the surplus acting as a kind of 'dividend of trust'. Social atomisation then works to see all university activities as functional in terms of securing the trust of governors. As trust is secured, so is the position of the Vice Chancellor. Lecturers must engage by keeping their learners contented enough to maintain enrolments: they will be rewarded by being allowed to keep their jobs! But maintaining learner enrolment is not an educational objective. It is not even a necessary condition for learning. The sufficient condition for learning is that "heart speaks to heart" - it is the realisation of the universal will - and of course it doesn't have to happen in a university, although one might hope that it does. This is the essence of the ethical problem of universities. Social atomisation replaces the "heart speaks to heart" of powerful and authentic conversations between teachers and learners with false conditions of maintaining enrolments, meeting learning outcomes and building surpluses. The cancer is in the fact that the more the false conditions dominate, the less possible it becomes to reach any kind of authenticity. The ethical problem is that there is no half-way-house between the individual will and the universal will. The more governors heed the doctrine of surpluses and atomisation, the less able they are to perform their governing duties of care towards universal things that bind the institution together. They themselves become atomised. Eventually it all falls apart. Not sure I'd want to be in a governor's shoes when that happens. But no doubt it will be the cue for a new governance report into university management! If there is a central theme to this introductory course in thinking about education and technology, it is 'constraint': the idea that our questioning about the worlds of education and technology are constrained by institutions, discourses, technologies and (frankly) other people. In the first week, I asked you to think of a question, and then to think of all the questions around that question which give rise to you asking the question in the first place. This is not only a good exercise for thinking deeply and searchingly - it is also an exercise in the identification of constraints. In week 2, I suggested an approach to reading which was similarly about identifying the constraints bearing upon other authors as they try articulate their ideas on paper. Writing is hard, and the PhD is fundamentally about writing. Writing is also shaped by constraints, and reading is very often about finding those authors (many of them dead) whose constraints relate to your own. In week 3, the issue of writing itself was dealt with. The exercise here was to examine the process and experience of writing as something where ideas from the mind find externalised expression. Externalising things allows us to play with the things we create, and in doing this, we can improve our writing (moving sentences around, for example). It's in this process of rejigging of things that we become more aware of the constraints bearing upon us, and become more capable of thinking them through (I think as I write this; I write to think). Last week, I focused on methodology and value. Methodologies are often represented as 'research recipes', but actually they are different world-views. World views themselves are dependent on the ways that the world constrains the way we look at it. If academics were deeply critical, they would never simply adopt a methodological recipe and call it 'research' (although so many do!). Instead, they would deeply examine their problem, using the different world-views of methodologies as ways of asking more penetrating questions until they find their own methodological synthesis. Now it is time to examine one of the major constraints that bear upon us, shapes our world-views, blinds us to aspects of reality, and even changes the way we write and think - this is technology. In this week's exercise, I want you to make a short (2 minutes) video of a space where you spend a lot of time. How are they important to you? What would your life be without them? What do you have around you which you don't consider to be technology? The point in doing this is to highlight the extent to which lives are lived immersed in technologies. This presents lots of questions, which I discuss in my video. Technologies excite us, and as they do so, so we change the way we think. Our expectations of the world change when we see something really cool (like, for example, the Oculus Rift which I discuss in the video). There are challenges to understanding how this happens, and what its effects are. We see dramatic social changes resulting from technological change: think about how everyone's head is stuck in a smartphone in waiting rooms or on public transport. Or how we all now use email. How did that happen? Do you remember people thinking "this will never catch on" a few years ago? Will it always be like this from now? What will be next? The problem with social change produced by technology is that, unlike social change produced through politics, nobody votes for it. It just happens, and it changes our lives. Some of the social changes produced by technology can be challenging for individuals and society. For example, think how many jobs now don't exist because they have been replaced with technologies. How many public services are cut-back for online services take their place? Is an online service the same as something face-to-face? Is the village store the same as Amazon.com? How can the village store compete? Technologies encourage a kind of rationalising way of thinking where people appear to become more like cogs in the machine. Human beings become 'instrumentalised' in some grand design of a 'system'. In whose interests is this done? The philosopher Martin Heidegger worried about this aspect of technology. He argued that living with technology was the dominant way of being in the modern world. He called it "enframing". He worried that technological thinking was a way of thinking whereby the real world was only viewed through a frame which showed the resources that could be exploited by technology. The Cybernetician Heinz von Foerster expressed this concern quite neatly when he said: "we have allowed existent technology to create problems it can solve." Heidegger believed that the only people who do not think in this way are artists, and poets in particular. Is he right? As a musician I think about this a lot: musical instruments are among the earliest of human technologies. Do they enframe? But what we have today seems new. The fact that all the data from the use of online tools gets fed back to global corporations to be aggregated and analysed is a new development in society. What does that mean for democracy and politics? Whose interests are served by these technologies? Who wins? Who loses? These are hard questions, and perhaps our greatest current challenge is that we lack the intellectual means to be able to probe them effectively. Our technologies are so complex that whilst we know we are constrained and manipulated by them, we struggle to articulate exactly how this happens, which leaves us powerless in the face of technology's inexorable "progress". Managements everywhere have to make decisions. How do they do this? What are the constraints that bear upon them as they do this? Management will often ask "why do you think we (or more usually, I) made this decision?" and seek to justify it. But this is the wrong question. The real question to answer is "when there are so many options, why did we not do anything else?" The answer to that question is the constraint that bears upon decision-makers that blinds them to alternatives. The biggest constraint is FEAR: the "Mind killer" as Frank Herbert noted in Dune. What are managers frightened of? Like the rest of us, we can start with the fear for their jobs. This fear will be proportional to their own ontological security, their own sense of confidence in their abilities, their confidence in being able to "deal with life" if they find themselves without a job, and so on. Basically, the less talent a manager has, the greater their fear of unemployment will be. Of course, fear also concerns their ability to maintain high standards of living and the family expectations (which carry their own constraints) that bear upon them. Managerial salaries have risen dramatically in recent years, and this will increase the associated risks of losing their position. It increases fear, and bad decisions which result from fear further compounds fear. Then there are personal constraints beyond money and security: the things individuals like - fast cars, personal entertainments, getting drunk; or the things individuals don't like - the French (say! ), broccoli, economy class travel. These too will create orientations of thought and decision which will blind individuals from examining all options. Around these constraints lie the economic constraints of the institution: the structural changes in university finance, the uncertainty of recruitment, the necessity to have some kind of surplus, and so on. All staff are told about are these constraints. Yet these are merely a veil over the deeper human concerns that underpin the personal lives of managers. I'm interested in exploring methods of analysis of management behaviour which can reveal the extent to which this is the case: deeper personal constraints are the 'dark matter' of the University, and understanding its efficacy, and producing evidence for its operation is an important development in our understanding of managerial behaviour more generally. It amuses me to think of David Willetts meeting with University Vice Chancellors, when Willetts will receive a ministerial allowance on top of his basic salary as an MP, which will be dwarfed by the salaries even of VCs for relatively modest institutions like my own. But high salaries = high stakes = big fear = bad decisions. How does somebody with a big salary and a position to defend mitigate their risks of losing their job? First of all, they will surround themselves with people who agree with them. Preferably people who are more frightened of losing their jobs than the person at the top. That effectively puts a 'talent embargo' on managers surrounding the top figures. Anyone with integrity and a strong academic reputation would be more fearless, act with less constraint, and - frankly - be more of a threat to a fearful top dog than a help. Untalented subordinates on high salaries are malleable. But there are deeper structural consequences of fear. The subordinates of managers act with more constraint than the person at the top, because they too are paid beyond their competence: the boss, if he or she is cruel and clever, will ever-so-often remind them of their defects and their dependence on pleasing him or her. The result is a very strong and self-reinforcing ring of steel round the leader. Subordinates, being more fearful, are less likely to listen to people on the ground: their ears will be focused only inwards. Their nerves will jangle in trying to manage the emerging crisis on the ground as staff 'squeal' (a popular term for the complaint of exhausted lecturers) with trying to appear strong and on-message to the senior management. They will demonise staff on the ground as they seek to shift blame for problems away from themselves. One hopes that the double-bind schizophrenic situation of these people excites the academic interest of the psychologists in UCLAN! The deep problem with this 'deafening' of management is that the only way any of us manage the constraints that bear upon us is by listening to each other. Listening not just to the people we like, or the people who think like us - they are not terribly useful in terms of handling constraints. It's the people who disagree with us, the people we don't like - they are the most important to be listened to. The human defence mechanism against constrained and pathological thinking is compassion, love, honesty and openness. Greed, ambition, lust, money and power all work against this. It all makes for disastrous management, funded by students, where all regulatory and accountability mechanisms have been corrupted by managers, where students get a raw deal in studying in institutions where staff keep smiling through gritted teeth and desperately try not to let their depression show. Despite their self-certified competence and professionalism, management are so subject to constraints that their decisions will almost always be worse than the decisions of anyone else whose common sense would not be constrained by such forces - anyone whose compassion, love, decency and openness has not been corrupted by the poison of money and power. Curiously, this is really a systemic phenomenon: these are not inherently bad people - although they may behave badly in the circumstances they find themselves in. The UCLAN emails deserve close study. I had a discussion yesterday about my previous post on the difference between the arts and the sciences. Basically, the question was "aren't scientists creative?" Of course, Sheldrake is a showman. But he knows a thing or two about religious fundamentalism, and he's right to spot it in the scientific establishment. The show that Sheldrake puts on is interesting. His target scientists will no doubt complain that his critique doesn't go anyway - it's not practical. "This stuff works, damn it! - we don't need to think about it" - and (frankly) it's too hard. Sheldrake is not inventing new concepts. He is delineating a space of critique - a ground for inquiry. It is in critical activity like this that we can see the connection between artistic thinking and scientific thinking. The problem that Sheldrake's got is that the religious zeal and dominance of dogmatic science is as real as the things he is suggesting are not explained by it. He can be an artist and delineate the form of absence left in the shadow of science, but unless he embraces the semantic codification, the egos (which he himself possesses in abundance!) that sits at the heart of dogmatic science and the industrious technological and empirical activity that follows from it, he will remain on the fringes. Here perhaps we can see how the question of the relationship between the arts and the sciences tells us about the difference between politics, knowledge, power structures and individual human experience. Codification is an interesting thing. Art needs codification as well as science - particularly performance art, where there is a necessity to coordinate performers. Musical notation does this job. The concretising of the expression of form is the hard part in composition. Getting the notes down takes such a long time. Why bother? Why not just improvise? Because the articulation of deeply coherent and complex musical structures is not possible within the flow of an improvised performance. Improvisation (however good the improviser - and some are remarkable) is a slide, not a ladder. I have always struggled to create ladders: how to stay focused, how to make decisions, how to coherently articulate what I want and stick to it. In trying to coordinate myself in the articulation of a musical form, am I being scientific? Possibly - but perhaps in a similar way in which Sheldrake is being scientific in articulating his critique - which to "normal" science isn't scientific! What do Creative Artists Do? Is it possible to articulate a scientifically-grounded description of the activity of a creative artist? Their way of thinking seems so fundamentally different from that of scientists; the type of people who work in the sciences and in the arts seem so fundamentally different in disposition. Where the principal aim of the scientist appears to be to attenuate the reality of the world to that domain for which they can create an abstraction (and which might be expressible by an equation, or some software), the aim of the artist is to embrace the entire complexity of the world; to be immersed in reality, and to use its constraints to delineate the form of what it is they wish to express. Artists will seek out complexity and revel in its beauty; scientists will seek to reduce it. They are different, but related processes. But what does my statement "delineate a form" mean? I can only speak from the perspective of a musician, but in music (on the rare occasions where I manage to finish a composition) I have a feeling when the ideas that I have laboured with for so long fall together in a way where it 'feels right'. What is this feeling? What is a 'form'? Scientists tend to work with ideas rather than forms: they seek an idea. I suggested a while ago what I thought this 'idea' is, referring to Katherine Hayles description of reflexivity: it's something like "the identification of a generating system responsible for observed complexity." Scientists start from complexity and work backwards. Artists start from complexity and seek more complexity to feed a process of discovery of form. How is a form different from an idea? Reality constrains us. Form is revealed through the exploration of boundaries produced by the constraints. The processes of the creative artist might be considered to be 'negative' in the sense that it works against the analytically perceived world to grasp the unperceived (or even the unperceivable) world. In order to explore the boundaries, the complexities of reality must be amplified. I tend to think of the human heart as the best generator of complexity: art entails a deep opening of the heart: a process of letting everything in; assenting to everything. It is very close in spirit to Bataille's description of eroticism. Sometimes artists use devices for generating complexity: a simple set of transformations of an idea. This is not science; it is not 'music by numbers' - it is simply a way of stimulating the psyche with richness. But if we are to let everything in, how does the artistic process work in managing everything, and how does it differ from the scientific process? The artistic process is a bit like a many layered multiple scientific process: there are rich patterns of analysis, of breaking down, of reduction. And each of these processes leads to some point at which there is a contradiction in the logic. This point is the point of boundary, and a point on the line of the form of a thing. As the analysis is approached from multiple angles, so the boundary of a thing starts to emerge from the different points that are articulated in individual analyses. The form presents the contours of the deep constraints of being. It's rather like the process of 'mapping' a fractal image through the exploration of the numerical properties of each point that demarcates the form of the fractal. Demarcating is what happens when an artist makes notes, or plans an artwork. From generated complexity, their processes of analysis seek different solutions to problems that are thrown up. Each attempt at a solution articulates a boundary point, and gradually those boundary points start to specify the form. But it's all pointless unless it communicates. How does it communicate? This I think is the key feature of the artistic enterprise. Scientific ideas can be communicated through semantic representation. Artistic form emerges through the identification of constraints which are inherently social from the very beginning. It is because they are an articulation of a shared biology, a shared humanity and experience that the communication is built-in to the act of creation. 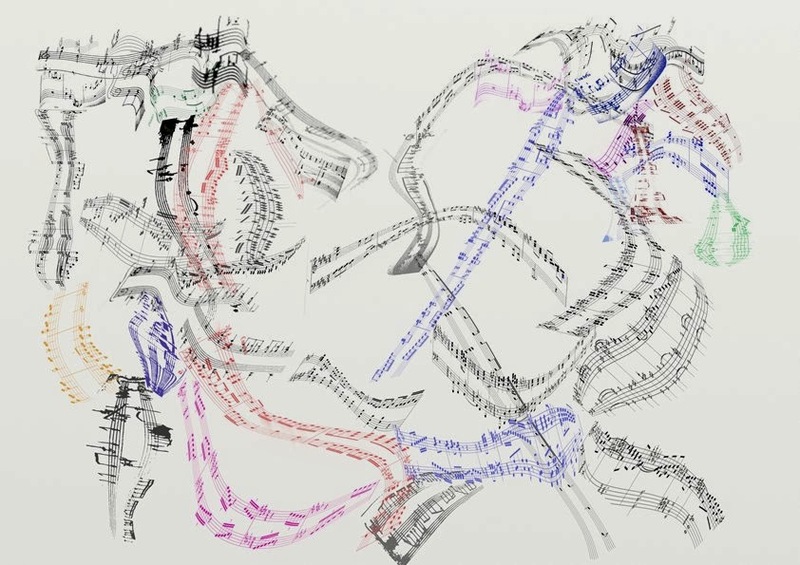 The performer who reads and performs the score must themselves trace the contours of form for which the artist has left their markers. Revealed in sound or colour or movement, the transformational effect on a listener or a viewer is the same process of articulation of shared constraints. I think this 'communication' sits behind what we consider to be 'semantic' communication of ideas. Our appreciation of concepts rests on the appreciation of the constraints operating on the minds of scientists, just as our appreciation of art is a recognition of the shared constraints that art articulates. Art asks the hardest questions about communication and society. But perhaps a deeper conceptual articulation of that process is not entirely beyond us. 'Methodology' is one of the first words budding researchers are confronted with. Like an aspiring artist who approaches a master and says "I want to paint", the master says "first you must acquire technique", so the budding researcher says "I want to research", the (not very good!) supervisor says "you must acquire a methodology". But technique doesn't make an artist; and methodology certainly doesn't make a researcher. Artists have to find their voice - and they do this by discovering their technique in the heart of what it is they want to express: it can be a slow and tortuous process of trial and error. Researchers in the social sciences must too find their voice, and off-the-shelf methodologies will rarely deliver this (they represent, after all, the voices of the inventors of the methodology! ); only profound critical engagement with the researcher's problem will lead to a methodological approach that is representative of the researcher's voice. Whatever method we choose, in education research there is a tendency to want to say "intervention x is good", "conditions y are bad", and so on. Such statements may be supported with methodological practices like Grounded Theory, Action Research, interview analysis, etc, etc. But in the end, the research is evaluative, declaring something good or bad. Accepting this means that our own values must be inspected. Indeed, this is a good starting point for really being able to grapple with the (often unwelcome) monster that is 'methodology'. What is your conclusion in your work? By what method do you reach your conclusion? If you're unsure about your method, why did your choose it? What does your choice of method tell you about what YOU are like? This is a challenging exercise. But the real value in exploring methodology is that it challenges us to think about our values through examining the values of those who promote different methodologies. These are the most challenging questions any researcher has to ask themselves because they strike at the heart of our own identity. Unfortunately, too often methodology is treated as a kind of recipe, and this self-inspection doesn't happen. The result is bad work! We tend to think of education as a service of delivery to meet individual learning needs. Marketisation, quality regimes, the risk of failure, pathological management, the potential for mis-selling, and social division all follow directly from this. This is because no 'service' that sets itself up to meet the learning needs of individuals can do so without creating a rift between the wants and desires of the individuals involved and the deep needs of the social collective within which the whole operation sits. Ironically, it may be because of the impossibility of institutionalised education to address this fundamental rift that we have become so addicted to it: like a drug where somehow we've convinced ourselves that whatever deficiencies are met by taking a bit, taking a lot more will cure. Like an addiction, however, berating those in the education system and saying that we have an education 'glut' will not wean us off education: it is, as with the alcoholic berated for drinking, more likely to lead to us to become more addicted to education. But if we accept that we have mass education on a historically unprecedented scale, there is nothing stopping us from rethinking the relationship between institutions of learning, learners and the society within which we all live. The move towards rethinking education and society is analogous to the move social media companies have had towards a business model that works for them: it has to do with balancing the individual as both a consumer of a service and as a worker for the organisation concerned. Why can't learners be both consumers of learning services and workers for their society? Indeed, this twin role is not new, the more traditional Universities long had this kind of model in operation. But technology allows us to think about updating it. Consumers of social media services become information workers thanks to the sophistication of data analytics. This helps the social media business generate revenue by selling analytic services. We tend not to think of learners as consumers of educational services becoming information workers in this way (unless they engage in practices like blogging or tweeting, which they might be encouraged to do!). The question is, with a University, who are they working for? The institution? Or their society? It is up to our politicians to decide this: and there is a very strong case to say that it ought to be the latter. Classrooms - whether in school, college or University - are microcosms of society. They are places where the ways that concepts are transferred from one brain to another are explored in various ways (by 'transferring' I simply mean to draw attention to what appears to happen in education, rather than to make any statement about what might actually happen). We spend most of our time as teachers wondering how it is that we might transfer a concept (in a practical sense), but think much less about what that process of conceptual transfer tells us about the world we live in. 'Informing' is one of the things that goes on in education. And since we characterise our current age as (variously) an information age or a knowledge economy, gaining a deeper understanding of the process of informing is very important. To put it another way, understanding the process of informing in the context of live data about actual learning processes from all our classrooms would create the context for better models of our society than we have ever had before. Every socio-economic group is represented, every pedagogical technique, every topic under the Sun... but latent patterns lie within the data of individual learning - particularly if there is the capability to aggregate individual learning on a massive scale. No society would rationally want to extend itself to vertiginous disparity between rich and poor if it had the means and the models to understand how to control it properly. To most reasonable people, the consequences of absurd disparity are horrible and destructive. The reason why we have this disparity is because we don't understand it, and we do not have the knowledge to be able to control it. Could (should?) we turn our learners into the information workers of society? Would we have the means to understand better what happens between individual brains with individual hopes, fears and the capabilities to cope with those hopes and fears? We go on about how to make people more creative, how education is rubbish, etc, etc. When we do this, we continue the pathology of seeing education as a service to the individual. We are education addicts. We should recognise this and start to try to harness individual learners as information workers for our society, whose ultimate effect - one might hope - will be better government and better democracy. “The promise of learning technologies is that they appear to provide what the theorists are calling for. Because they are interactive, communicative, user-controlled technologies, they fit well with the requirement for social-constructisit, active learning. They have had little critique from educational design theorists. On the other hand, the empirical work on what is actually happening in education now that technology is widespread has shown that the reality falls far short of the promise." "While we cannot expect that a revolution in the quality and effectiveness of education will necessarily result from the wider use of technology, we should expect the education system to be able to discover how to exploit its potential more effectively. It has to be teachers and lecturers who lead the way on this. No-one else can do it. But they need much more support than they are getting." The odd thing about all this is that at no point is it suggested that the theories might be wrong. This is curious state of affairs, particularly with learning characterised as a “design science” (what’s that, exactly? ); after all most scientists on encountering results that fail to meet their theory would consider changing their theory! In education (it's unfair just to single out Laurillard in this) we don't do this; instead we cast blame on social factors which act like 'noise' in interrupting the perfect realisation of the theoretical model. Education isn't alone in the social sciences in behaving like this. Economics is the most notorious example of being wedded to theories which are clearly deficient: econometric abstractions explain nothing of social life, yet it is virtually impossible to get an economics paper published unless it's got some ridiculous equation in it (despite the fact that the greatest economists of the 20th century - Keynes and Hayek - used very little maths, and Hayek was scathing about formalism). The equivalent of econometrics in education is what we might call 'modellism' - that is, the rigid, uncritical attachment to models of how things should ideally work in the face of evidence which cannot be explained by the model and modelled predictions which fail to materialise. Everything suggests that the model (whichever one it is) cannot possibly be right. Yet, the model is never revised. Laurillard's "Conversation Model" which she borrowed from Gordon Pask seems innocuous enough. But her own modellism cannot allow her to think that the model is wrong. So blindly she (and everyone who follows her) continues to tread empty ground while the political battlefield of education moves on and bad ambitious people who don't think much take advantage of the confusion of the educationalists. Pask's model is wrong because it is a 'billiard ball' model of conversation. Each utterance has a determinate causal effect on the state of both the teacher and the student (for a deeper explanation, see http://dailyimprovisation.blogspot.co.uk/2013/08/was-gordon-pask-right-about-conversation.html). There is no space for intuition, joy, love, humour - all of the qualities which indicate really powerful conversations. But these absences suit those with behaviourist intentions! The fundamental question in education is "what are the needs of society and how might they be addressed through the meeting the learning needs of individuals?" The need of our society is equity. We need empathic, loving and caring education - all the qualities which lie outside Pask's model. So we must critique our models. We must be more scientific. We must seek to explain what happens, and not simply tweak our practices ignoring what happens. And we must accept our share of responsibility for the terrible state of Higher Education management and put our critical faculties to proper political and scientific use.